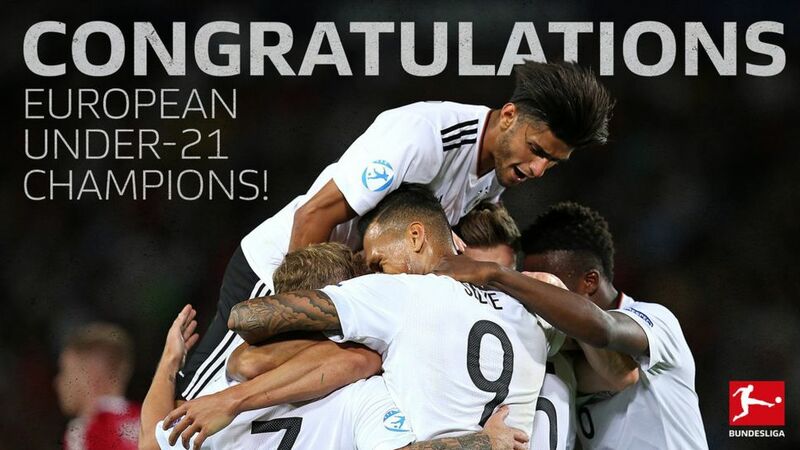 DFL President Dr. Reinhard Rauball and CEO Christian Seifert have heaped praise on Germany's UEFA Under-21 champions. Stefan Kuntz's Bundesliga-heavy troupe beat Spain 1-0 in Krakow on Friday, becoming only the second Germany team in history after the class of 2009 to win the tournament. "Congratulations to our U-21s on this fantastic triumph, congratulations also to Stefan Kuntz and his coaching and backroom staff. We could not have dreamed this achievement possible before the tournament. The players should be very proud of how they performed and of what they achieved at the European Championship. It's my wish that the players get as much playing time as possible in the coming season." "Congratulations to Stefan Kuntz and his team on this extraordinary achievement. It was a lot of fun watching the team in the knockout stage. Even more so as all the youngsters have pretty much all come out of Bundesliga and Bundesliga 2 clubs and their youth academies. The performances at the finals will give the careers of the players a real boost and inspire other talents."